If you are having issues running WEB reports using IE, please try Chrome or Firefox. You will only be able to run these reports once you have FIS access and Data Warehouse Access. Select the report you wish to run by clicking the "Web Report" link. 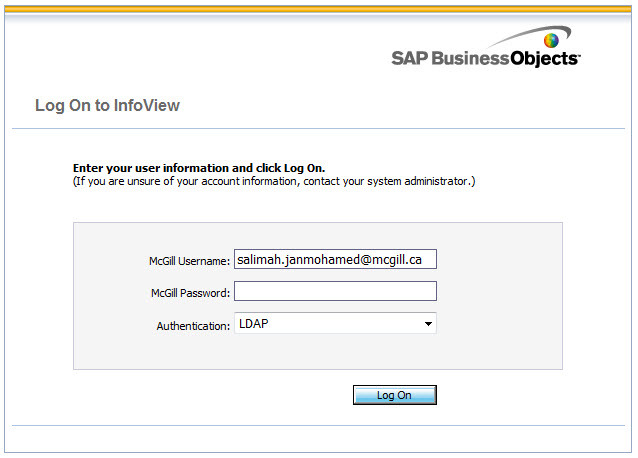 Below the McGill Password field, ensure that Authentication is set to LDAP. A Database Logon screen for banrep will appear. At the prompt, enter your report parameters. Remember to complete all fields. Use the icons in the Crystal Reports web browser to print, save, and export the report. Consult the IT Knowledge Base for troubleshooting tips (supported browsers, printing issues, etc.). Note: These steps were performed using Internet Explorer and for other browsers, steps 5 to 7 may be different. | This method has no options as the desktop version. Formatting cannot be preserved in the export to excel. Select the report you wish to run by clicking the "Crystal Report" link. The report template will open up in the Crystal Reports environment. Click the Refresh button (F5) to run the report. 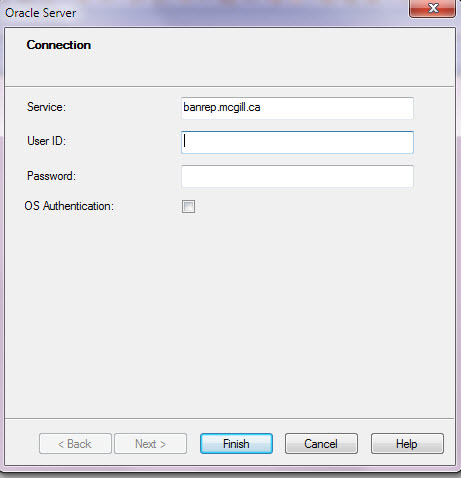 An Oracle Server window will appear. Ensure the Service field displays banrep.mcgill.ca. The report displays your data dependent on the data entered in the parameters. Click the Print icon to print the report. To refresh the report or run the report with new values, click the Refresh button (F5). To toggle between pages, click the arrows located at the top right of the page. To save the report click the Save button. In the Crystal Reports environment you may edit or manipulate the report. Note – All of the actions listed below may be performed in both the Design and the Preview tabs. The instructions below state the recommended tab to use. In the Preview Tab, click on Report > Record Sort Expert. Select the field that you want to sort the report by and click the Greater Sign button. Note: Depending upon how many groupings are in a report, the sort order may be superseded by the groupings. Click on Report > Record Sort Expert. Select it from the "Sort fields" section and drag it to be the first sort. Display transactions matching a specific value for a field appearing in the report . For example: Transactions posted to Account code 700026 or Transactions with an Actuals value greater than $5,000. In the Preview Tab, click on Report > Select Expert > Record. A new window will open. Click on the New button and choose the desired field from the listing of Report Fields(for example: ...ACCOUNT_CODEor ...OPERATING.ACTUALS). Click OK.
From the drop-down list, select a criteria (for example: "isequal to" or "is greater than"). Type in the value of the select criteria (for example: the Account code "700026" or the value "5000") and click OK.
Click on "Use Saved Data"
(for example: group transactions by Activity code, group funds by FFM). In the Preview Tab, click on the Data field that should be used to group the data (the field will be highlighted). Click on Insert > Group. 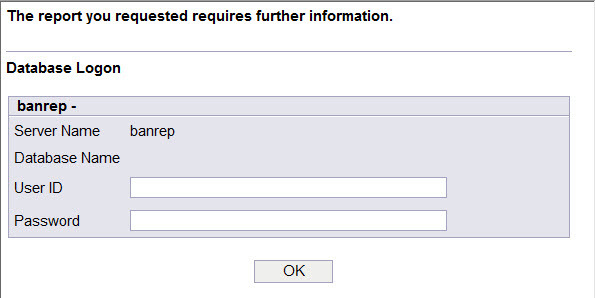 The selected data field will appear in the "When the report is printed..." section. Click OK. A new group for the selected field will be created. Repeat thesteps aboveto create additional groupings. In the Preview Tab, open the Field Explorer dialog box. Expand the Database fields by clicking on the "plus" sign. Click on a field and drag and drop it into the group header. Switch the grouping order of the displayed transactions. To switch the Grouping order, go to the Design Tab. Click on a group header on the left hand side of the report (for example: Group Header #2). Hold the mouse button and drag it up (to become Group Header #1) or down (to become Group Header #3). Change the Background color of the Group Header. Either in the Preview or Design Tab, right-click on the Group Header on the left-hand side of the report. Click the Color button on the top right of the newly open window. Check off the Background box. In the Design Tab, right-click on the Group Header you wish to delete and select Delete Group. Hide transaction details and only display the group header/footer. In the Design Tab, right-click on the Details Section on the left-hand side of the report. Select Hide. This will allow you to drill down by double-clicking on the group. Select Suppress. This will not allow you to drill down. Display transaction details which are hidden. Select Show. This will display the transaction details. Add a fund to a report that queries only one fund. 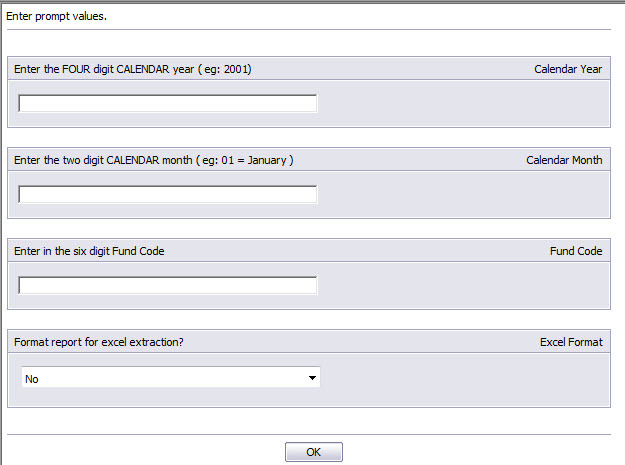 From the drop-down list, select "is one of"
Type in the Fund codes you want to include in the report. Open the Field Explorer dialog box. Expand the Parameter fields by clicking on the "plus" sign. Right-click on "Fund Code" and select Delete. In the Design Tab, expand the Database fields by clicking on the "plus"sign. Find the Fund_Code_Key field, drag and drop it next to the Fund Code in the Page Header section. Reduce the height of a section (header, footer, details) - there is a lot of white space remaining, but, something is blocking the section from being reduced. In the Design Tab, move out all remaining objects from the section which needs to be reduced (if applicable). Right-click on the section name on the left-hand side of the report. Select "Select All Section Objects". Any objects remaining in the section will be highlighted in blue. Hit the Delete key on the keyboard. The selected objects will be deleted. Move the objects which should appear in the section back in (if applicable). Reduce the height of the section.